This Michigan Wolverines Dog Tee Shirt is Officially Licensed NCAA Pet Apparel. 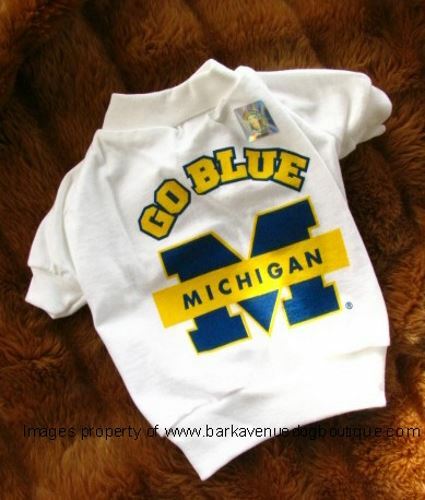 Let your dog show his or her team spirit with this adorable Michigan Wolverines Dog Tee Shirt featuring the team logo. These dog tees feature screen-print graphics, and rib-knit collars and cuffs. Please see sizing chart below to determine what size your dog will need. Bear in mind that all dog sizes are not created equal. Some dogs are heavier than others, and this should be taken into consideration when ordering another size. If your dog is of heavier build, we recommend ordering the next size up for width or length. Unless otherwise excepted, shipping of products purchased will be within 1-2 business days after payment is received. Items returned for refund must be clean, in the original condition and in the undamaged original packaging. For inventory management purposes we do not exchange items. We request you purchase the replacement item you want, then return the original for a full refund. Credit and debit cards are processed through PayPal. Please note that a PayPal account is not required to use your debit or credit cards. Personal checks are not accepted. Product listings are subject to availability. Pricing is subject to change without notices. Due to manufacturing variances, the products color may vary slightly from the image with the listing. Pennsylvania residents will be charged 6% sales tax.